A number of methods of spinal stabilization using wires, rods, screws and spacers have been recently described. The technical revolution in instrumentation is continuing to evolve. These techniques make spinal stabilization safe and effective. We describe an alternative technique of spinal stabilization that involves a combination of previously described techniques and employs plates/rods, screws and spacers. The technique provides reassuring stability at the point of fulcrum of spinal movements and a ground for ultimate segmental arthrodesis. Three patients were treated with the described technique. The indication of treatment in two patients was the instability related to degenerative spondylosis and in one patient the instability was related to ossified posterior longitudinal ligament. In all the 3 cases, the fixation with the described technique was done only at one spinal level and at other levels the fixation was done by transarticular screw fixation or by intra-articular spacer impaction. The described technique was essentially employed where transarticular/interarticular method of fixation was either not possible or was unsuccessful, generally related to facetal shearing during the process of implant insertion. The patient was placed prone with the head end of the operating table elevated by 30°. Gardner-Wells traction was applied to stabilize the head during surgery and the direction of the traction resulted in a near-floating head position and avoided pressure on the face. A midline skin incision was made. The spinous process of the axis was exposed to identify the exact level of surgery. The facets on both sides were exposed after a subperiosteal dissection. The technique of impaction of intraarticular spacers has been detailed elsewhere and is summarized here. , The facets were distracted using varying-sized osteotomes ranging from 1.5 to 4 mm in thickness. The flat end of the osteotome was introduced into the facet joint and then turned 90° to make it vertical to effect distraction. The articular cartilage was widely removed using a screwing motion of the osteotome and when necessary a power-driven microdrill. The Goel cervical facet spacer was impacted into the joint by using gentle hammering over the base of the spacer impactor [Figure 1]a-d. The spacers varied in height from 2 to 4 mm, and the diameter was 8 mm. More often spacers with a height of 2.5-3 mm were used. The interspinous ligaments were widely removed in the treated spinal segments. Plate and screw fixation of the facets was then done. A 2-holed titanium plate (approximately 14 mm in length) was placed over the surface of the facets after appropriately flattening the region with microdrill. Facetal screws are then inserted through the holes in the plate by the technique described earlier by Roy-Camille and Saillant. The screws used in the present series were of 2.6 mm thickness and 16 mm length. Bone graft was harvested from the iliac crest and was placed over the adequately prepared host bone area of laminae, facets and spinous processes. Post-operatively, the traction was discontinued and the patient was placed in a four-poster hard cervical collar for a period of 3 months, and all physical activities involving the neck were restricted during that period. After this period and after confirmation of spinal fusion, routine activities were permitted. The follow-up was 30, 33 and 36 months. In all the three patients, the fixation was successful and without any incidence. Successful segmental arthrodesis was achieved in all cases. There was no mechanical instrumental failure or infective complication. The technique of fixation described in the present report is an extension of the technique used and described by us for craniovertebral atlantoaxial stabilization. Removal of articular cartilage, distraction of facets and insertion of spacers within the articular cavity provide a firm stabilization of the region. Plate and screw fixation provides reassuring stability. The entire construct provides a ground for segmental arthrodesis. Although our experience is rather limited, but our results and experience suggests that the technique has a great potential. The ease of conduct of the procedure and its safety are the highlights that can be exploited to provide segmental spinal stabilization. 1. Goel A, Shah A. Facetal distraction as treatment for single- and multilevel cervical spondylotic radiculopathy and myelopathy: A preliminary report. J Neurosurg Spine 2011;14:689-96. 2. Goel A, Shah A, Jadhav M, Nama S. Distraction of facets with intraarticular spacers as treatment for lumbar canal stenosis: Report on a preliminary experience with 21 cases. 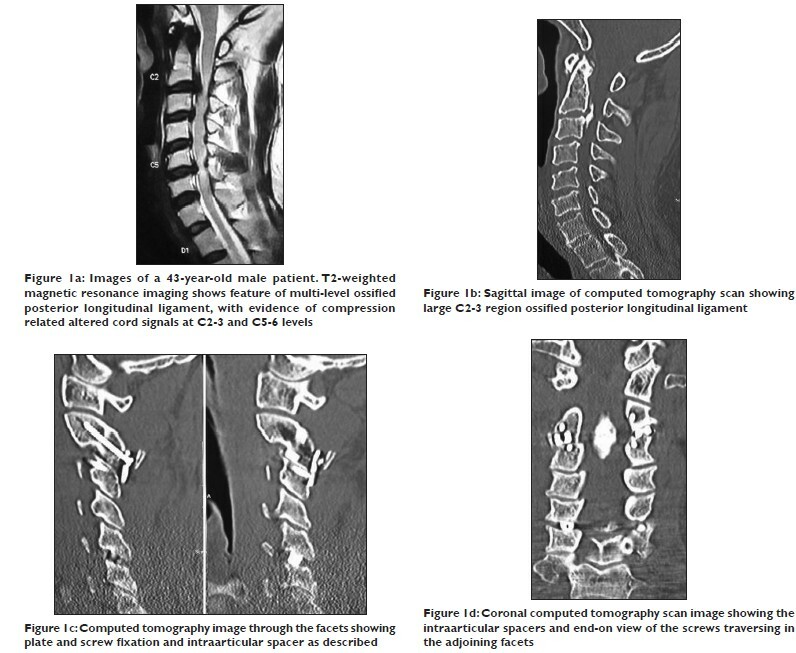 J Neurosurg Spine 2013;19:672-7. 3. Roy-Camille R, Saillant G. Surgery of the cervical spine. 2. Dislocation. Fracture of the articular processes . Nouv Presse Med 1972;1:2484-5. 4. Goel A. Facet distraction spacers for treatment of degenerative disease of the spine: Rationale and an alternative hypothesis of spinal degeneration. J Craniovertebr Junction Spine 2010;1:65-6. 5. Goel A. Facet distraction-arthrodesis technique: Can it revolutionize spinal stabilization methods? J Craniovertebr Junction Spine 2011;2:1-2. 6. Goel A. 'Only fixation' as rationale treatment for spinal canal stenosis. J Craniovertebr Junction Spine 2011;2:55-6. 7. Goel A. Atlantoaxial joint jamming as a treatment for atlantoaxial dislocation: A preliminary report. Technical note. J Neurosurg Spine 2007;7:90-4. 8. Goel A, Desai KI, Muzumdar DP. Atlantoaxial fixation using plate and screw method: A report of 160 treated patients. Neurosurgery 2002;51:1351-6. 9. Goel A, Laheri V. Plate and screw fixation for atlanto-axial subluxation. Acta Neurochir (Wien) 1994;129:47-53. 10. Goel A. Treatment of basilar invagination by atlantoaxial joint distraction and direct lateral mass fixation. J Neurosurg Spine 2004;1:281-6.